I really enjoyed teaming up with Amanda Johnson to present on Digital Marketing strategy at the 2011 E-Biz Forum on September 27. This is such a huge topic that we had hours of material—and the hardest part was fitting everything into a 50-minute session! 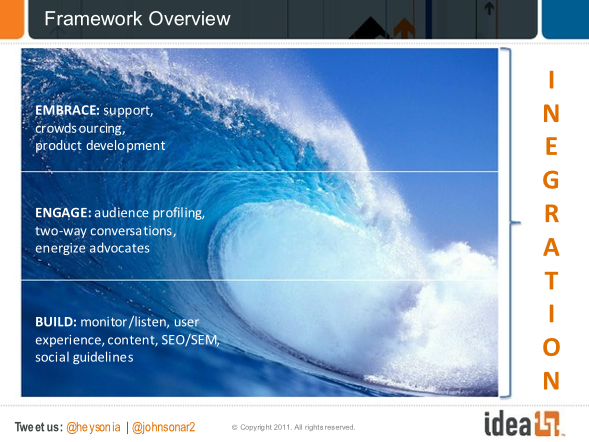 Build: developing your strategy—questions to ask, listening and monitoring, evaluating your audience, etc. Engage: interacting with current and potential customers via social networks, forums, effective content, SEO, and more. Embrace: integrate tools into your business so you can become more innovative and efficient. Since technology changes so quickly, we focused on developing the strategy and goals necessary vs. focusing only on the tools available. The slides and video should be available soon.